AWA Dental Plus is a fully insured dental plan that pays for services and procedures based on a graduating scale of benefits percentages that increase over a period of three years. The plan pays the highest benefits on Year 3, so it is to the member’s advantage to maintain their dental plan. AWA Dental Plus also includes an orthodontic benefit for dependent children to age 19. Members have access to the Alliance dental PPO network, one of the largest Dental PPO Networks in the country, with more than 100,000 unique dentists at 240,000 access points nationwide. With so many options, there is sure to be a network provider nearby. Davis Vision is pleased to provide members with a low-cost, traditional Vision Discount Program that provides discounts on eye exams, lenses, frames and additional eyewear options. Members simply visit a participating vision provider and present their discount card. With 30,000 participating vision providers, members can find a provider near them by calling Davis Vision at (877) 923-2847 or visiting www.davisvision.com. The percentage shown is the percentage of the policy’s maximum allowable charges (MACs) that the policy will pay for covered services provided by either a participating dentist or a nonparticipating dentist. participating dentists accept the maximum allowable charge as payment in full. Nonparticipating dentists may bill you for the difference between their charge and the maximum allowable charge paid by the policy. United Concordia Dental’s standard exclusions apply. Dependent children are eligible to age 26 in all states. The United Concordia Individual Dental Insurance Policy (“Policy”) includes a complete listing of covered services, limitations, exclusions, cancellation and renewal provisions. In the event of conflict, the Policy will govern. PPO individual dental products underwritten by: United Concordia Insurance Company when issued in AR, AZ, CA, CO, CT, FL, GA, IN, LA, MA, MI, MS, NM, OH, OK, OR, RI, SC, TN, TX, VA, WA and WV; United Concordia Life and Health Insurance Company when issued in DC, DE, IL, KY, MD, MO, NC, NJ and PA; United Concordia Dental Corporation of Alabama when issued in AL; and United Concordia Insurance Company of New York when issued in NY. United Concordia Insurance Company is not licensed in AL, DE, DC, IL, KY, MD, MO, NJ, NY, NC and PA. Not all products are available in all jurisdictions. United Concordia policies cover dental benefits only. United Concordia Insurance Company, California certificate of authority number 3739-0, is domiciled in Arizona at its statutory address, 2198 East Camelback Road, Suite 260, Phoenix, AZ 85016. Available Concordia products are underwritten by United Concordia Insurance Company in OK and written on OK policy form OKIN01-0312UCIC. The administrative office of UCCI and/or its licensed corporate affiliates is located at 4401 Deer Path Road, Harrisburg, PA 17110. 1 Issue Age is 18 and over; dependent children covered up to age 26. 2 Orthodontics is for dependent children up to age 19. One-time $35 enrollment fee applies. Fee is waived when dental is added to an active AWA membership. United Concordia knows how important oral health is to overall health—they have specialized in dental insurance for over 40 years. A national dental-care company, United Concordia has provided flexible, affordable dental insurance plans and great customer service to more than 7.5 million members nationwide. A recognized leader in the industry, United Concordia focuses on improving the oral health and well-being of the members they serve. 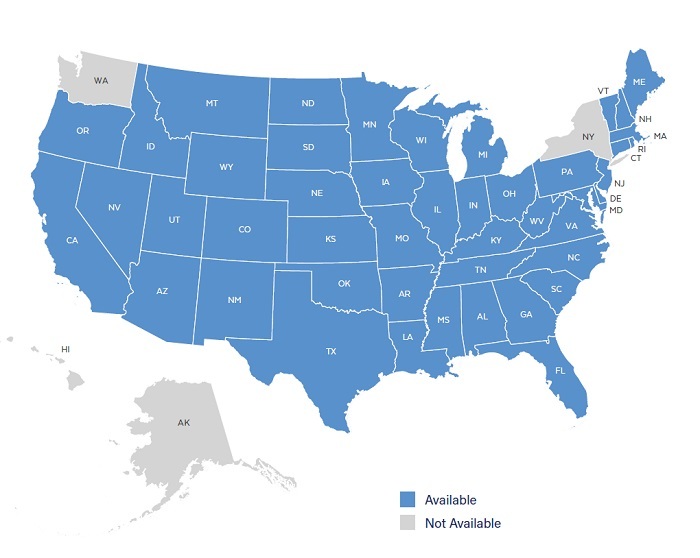 AWA Dental Plus is NOT Available in: AK, HI, NY, WA.